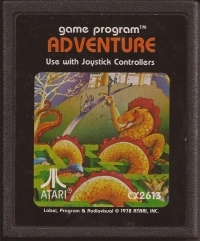 10-13-2012 exonerator Description One of the most famous Atari 2600 games, and probably the first console videogame to contain an Easter Egg - by placing a certain object in a certain place in the game, the programmer's name is revealed on the screen. 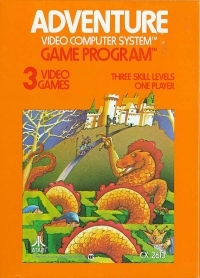 It is also considered by many to be the first graphical Adventure game, and was directly inspired by the original text game called Adventure by Willie Crowther and Don Woods. 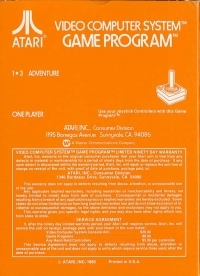 The original text game ran on mainframe computers and required hundreds of KB of memory - Atari 2600 programmer Warren Robinett had to figure out how to make a graphical version in only 4KB. After evaluating the project, his boss instructed him not to pursue it because it couldn't be done. However, the finished cartridge sold 1 million copies at $25 each, for which Robinett received his regular salary of $22,000/year. This is a list of VGCollect users who have Adventure (Picture Label) in their Collection. This is a list of VGCollect users who have Adventure (Picture Label) in their Sell List. This is a list of VGCollect users who have Adventure (Picture Label) in their Wish List.